Evernote is a free cloud service for storing all your notes, or in this case, scanned PDF files. Evernote integrates seamlessly with ScanSnap to free you from the paper monster. Evernote allows you to easily search and tag all your documents so you can retrieve them whenever you like. By combining Evernote with ScanSnap, you’ll be able to digitalize all your paper documents and access them from any computer or mobile device, anywhere in the world. Using Evernote doesn’t cost anything. The free plan gives you 40MB of uploads per month. Depending on the quality setting on the ScanSnap S1300, you can upload hundreds of documents every month before hitting the limit. The premium plan cost $5 per month or $45 per year and gives you 500MB of upload per month. Even if you don’t plan on scanning more than 40MB worth of documents a month, I would still recommend the premium plan because it offers SSL encryption syncing. If you’re scanning sensitive documents and putting them on Evernote, this extra layer of security is well worth the $45 cost. It’s really a no brianer. It might have been a dream 30 years ago but the true paperless office is here and it’s real. It felt so good to send those filing cabinets and paper to the recycling center. 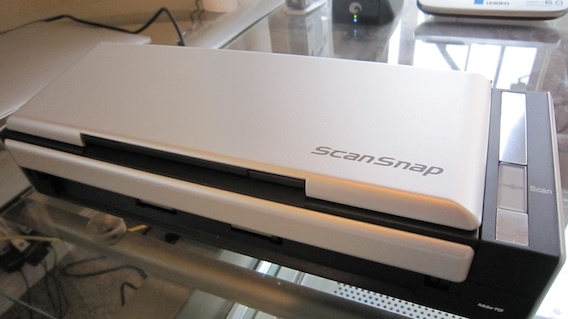 Watch the video below to see Sally and I give a demonstration on using Evernote with the Fujitsu ScanSnap S1300.